The students were chosen to take part by Ms. Bradley and Ms. Rodriguez – new Principal and Vice Principal of the STEAM Academy – based on teacher recommendations. 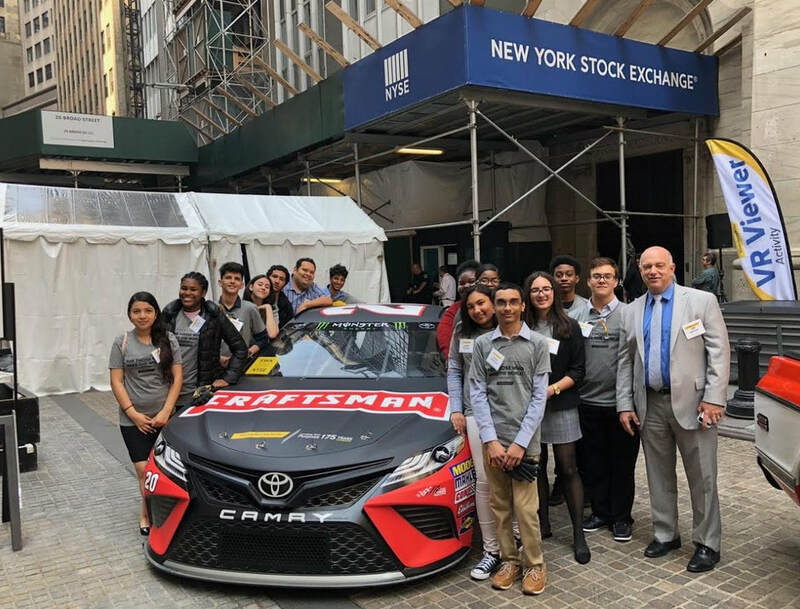 Stanley Black & Decker set up its mobile Makerspace stations on a cordoned off portion of Wall Street, and each was fully equipped with Stanley Black & Decker tools and manned by the company’s educators. Stations included a derby car building station, an augmented reality station, a jig-saw puzzle station and a bridge building station. The augmented reality station focused on tech and had students creating their own 3-D goggles and testing various lenses. The derby car station had engineering partners build and race their own small cars. They then used race data to make design enhancements, run again and track the results of their changes. Former NFL coach and NASCAR owner Joe Gibbs, as well as NASCAR driver Erik Jones, both enjoyed sharing insights with the students during derby car trials. “This was a day full of the kind of project-based and problem-based learning that is the foundation for the STEAM Academy,” said Deputy Superintendent of Schools Dr. Jeff Gorman, adding that the students were highly engaged and enthusiastic about this new initiative for the district. Stanley Black & Decker also shared that it will be making a donation to the district to recreate the Makerspace experience the kids enjoyed as an ongoing afterschool club for next year at the STEAM Academy. The eventual goal is to have more companies, particularly ones in and around Mount Vernon, to welcome students for internships that may lead to possible future employment. Each STEAM Academy student will engage in a capstone research project during 11th and 12th grades that may include an internship, and there would be immense value in having more of these corporate partners included in Mount Vernon’s design. The Academy’s challenging co-curriculum will include clubs and potential classes in robotics, coding and programming and gaming, among other STEAM topics. Students will also participate in the nationally recognized Project Lead the Way courses in engineering, with the possibility to include biomedical and computer sciences. The hands-on elements of the curriculum will be complemented by content consumed and created in an otherwise digital environment, and students will be equipped with their own dedicated devices in school with access to digital curriculum resources outside of the school day.